The Nike FI Flex Men's Golf Shoe flexes with your foot for a smooth, natural feel and features lightweight cushioning to help keep you comfortable through to the eighteenth hole. 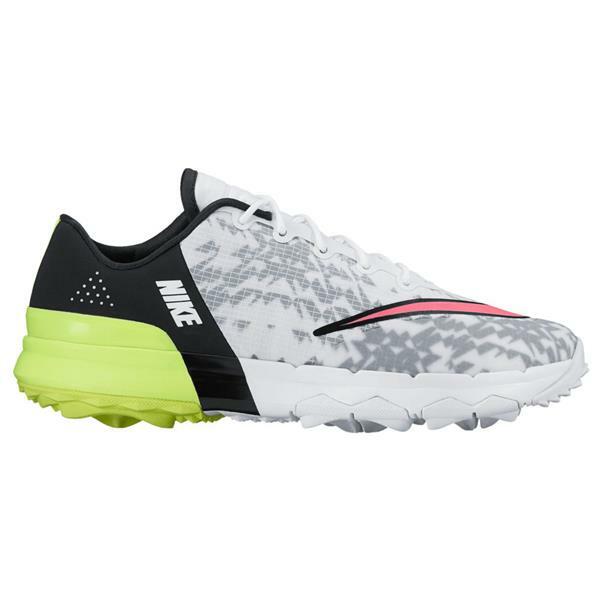 The Nike FI Flex Men's Golf Shoe flexes with your foot for a smooth, natural feel and features lightweight cushioning to help keep you comfortable through the eighteenth hole. lush Cushioning: A lightweight Phylon midsole provides soft cushioning underfoot, while a foam collar and tongue surrounds the top of your foot and ankle in plush comfort. Weather Protection: A nylon upper has a DWR (durable, water-repellent) finish. Ripstop fabric is added to the forefoot for lasting durability. Inspired by Nike Free technology for exceptional ground feel and adaptive cushioning. Lightweight Phylon midsole provides adaptive cushioning for comfort and stability through your swing. Rubber outsole features an aggressive, Integrated Traction pattern for grip on a variety of surfaces.